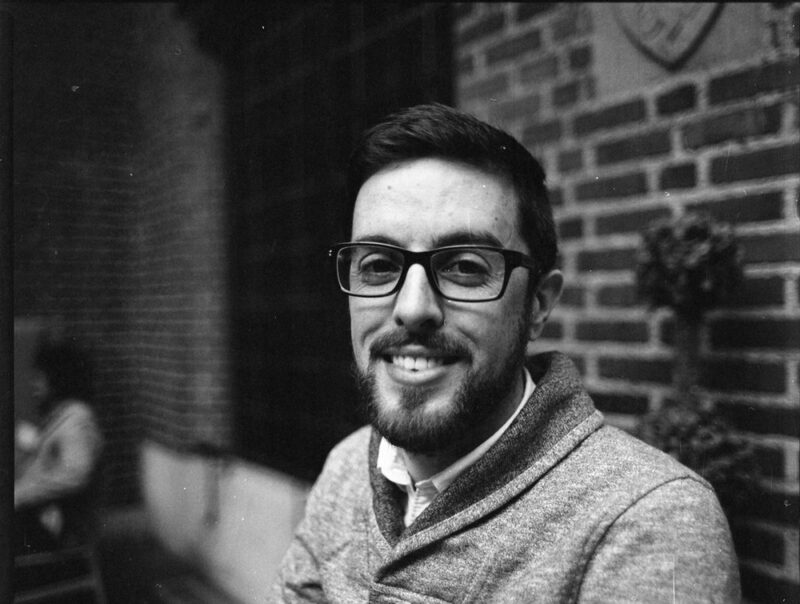 Alex Gilford is the latest in a long line of Metro-Detroit locals making Art in Woodbridge. 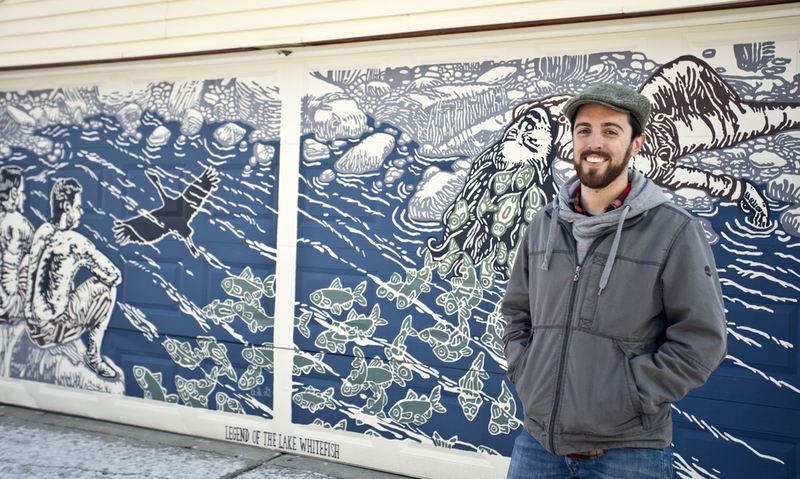 His “Legend of the Lake Whitefish “mural covers a garage in Woodbridge and depicts a scene from a piece of regional folklore of the same name. AIW caught up with him during his lunchbreak at the Detroit Institute of Arts. AIW: How did the project come about? AG: Some time ago Larry had brought up the idea of having a mural painted on the garage, possibly to cover up the tag on it and to continue waking the alley up with more artwork. I didn’t have any ideas that would fit the space at the time, but when I started this series inspired by regional folklore, I thought it would work well. I sent a proposal to Larry, he liked it, and he came up with the idea of extending the imagery onto the neighboring garage door. AIW: You also work in oil and linoleum block prints? AG: Yes, I have been working on a series of genre scenes in both direct oil painting and small linoleum block prints for a number of years (alexgilford.carbonmade.com). I wanted to do something more illustrative and tell stories with block prints. I started getting inspiration from the block prints of José Francisco Borges and other literatura de cordel artists from Brazil as well as the block print illustrations that Carl W. Bertsch did for Grace Lee Nute’s book, The Voyageur. After getting more interested in regional history and folklore, I thought it would be a great medium for retelling these stories. The illustrations that I have been working on recall tales that are relevant to this area so I want as many people as possible to have the opportunity to learn about some of this region’s folklore and get the same sense of curiosity that I feel. The best way to do this is to have the art directly and openly placed in the community – in the neighborhood. I knew about the Art in Woodbridge project that Larry does so I started planning out how to treat the linoleum block prints as a step toward larger scale public paintings. AG: I was doing a Curatorial Internship at Detroit Historical Society and the main building I was working in was at Historic Fort Wayne. I was in the archives one day and I picked up a book by Mary Caroline Watson Hamlin — she wrote a book in 1883 called Legends of le Détroit. One of her goals in writing the book was to preserve the stories that were passed down through her family relating to early French Detroit culture and this region’s Native American culture (through the lens of the Settlers). At that time, around the turn of the 19th and 20th century there were a handful of authors that were trying to preserve early folk stories because they were worried about the memory fading due to the rapid rise of the industrial revolution and the modernization that it brought. So, the mural — it’s the Legend of the Lake Whitefish and it is derived from an Ojibwa story. It’s about how the Lake Whitefish in the Great Lakes were created. There are different versions of it. The one in Hamlin’s book was a quote from another story called The Fisherman of Grosse Pointe. A Legend of the Grand Marais. The details of the story in that quotation are different than other retellings that came from around the same time. AIW: Is there anything on the mural that would cue the viewer to that author, or tale? AG: The whole mural depicts the Legend. There are three panels to it. The one panel of the woman laying on the rocky shore with the Lake Whitefish swimming out of her hair — that panel references the quote in The Fisherman of Grosse Pointe. A Legend of the Grand Marais. In this version she wasn’t decapitated, but in other accounts she was. Excerpt from Hamlin’s The Fisherman of Grosse Pointe. A Legend of the Grand Marais from Legends of le Détroit. 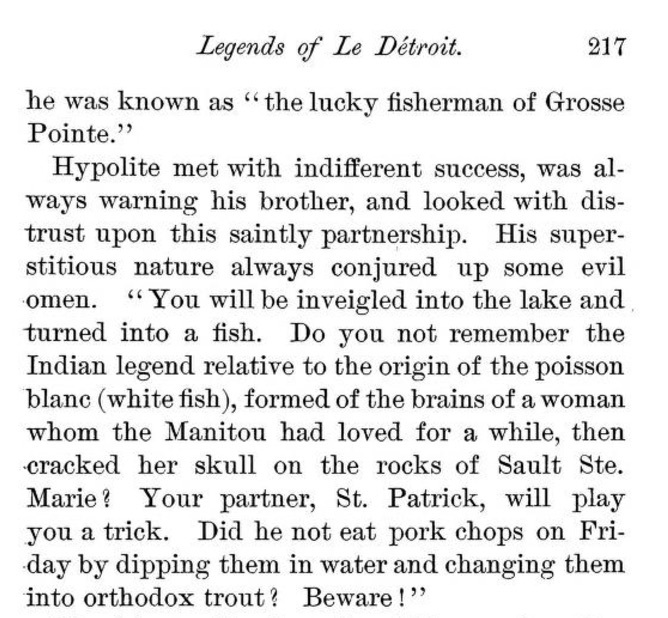 The Origin of the Whitefish in Charles Montgomery Skinner’s Myths and Legends of Our Own Land, 1896. AIW: And what brought you to Detroit? AG: I graduated from Kendall and I was interning at Grand Rapids Art Musiem for a while. When that was over I went to Mexico for an artist residency for a few months. Then I moved back to Davisburg where my parents were living and I was interning at the Flint Institute of Arts, part time. I decided to move down to Detroit, got a job here (2014). In the fall, I started grad school at Eastern. AG: The photograph of the murals taken by Cassie Padula will be in the art exhibition for the Spring Program Series, Tall Tales and Folklore: Exploring Michigan’s Traditional Stories at Albert L. Lorenzo Cultural Center. That opens on March 1st, ’17. Soon I will be working on a smaller outdoor panel across the alley from the Legend of the Lake Whitefish murals; it will be inspired by a legend that involves Col. Jean François Hamtramck. Currently I have an oil painting, St. Andrew’s on Gratiot, on display and for sale until the end of March ’17 at Ackroyd’s Scottish Bakery in Redford Charter Township. AIW: One of the little taglines for Woodbridge is “Detroit’s Public Art Destination.” You live in Woodbridge. You see it all the time. How is that important for the community? AG: Woodbridge is a beautiful and historically significant neighborhood in Detroit. A couple of the qualities that I appreciate in the neighborhood the most are the abundance of trees on the interior that provide a green canopy in the warmer months and the Victorian structures that sometimes date back over one-hundred years; each one has such a unique character and people in the neighborhood care for the properties. I think that it is a valuable pursuit for artists to play a part in caring for a community through the utilization of their art and I think it is important for a community to actively engage creative thinkers. There are many factors that go into neighborhood stabilization and vitalization, but I certainly think that mindful artists who are connected to the community that they are working in have a significant role to play. AIW: Is there a value to having a community where every turn, every corner, every alley there’s some form of public art? Why do people do that? AG: One of the things that the visual arts does really well is getting people to slow down and look closely – look around to dissect and interpret their visual environment. With some practice the viewer becomes more aware and in-touch with what is around them. This is a way that I think public art can benefit the communities that they are installed in. It can connect people with place.